The Dean Martin Show was a 60 minute musical/comedy/variety series on NBC that aired from September of 1965 to May of 1974. It featured Dean Martin's singing and doing comedy skits with and without well-known guest stars of the day. There were also numerous beautiful girls drooling over Dean to emphasize the life-style that he was known for as a partying, boozing, womanizer who also happened to be a remarkably likeable guy! NBC literally begged Dean Martin to do a TV show because they were sure it would be a huge hit but Dean was not particularly interested. He finally gave in when NBC agreed that he would not have to do any rehearsals and he would only have to show up one day per week on Sundays! Lee Hale would "stand in" for Dean in one rehearsal on Saturday. NBC also agreed to pay Dean a salary which would have not even been considered for any other star at the time but NBC came out fine as the show made big bucks! While popular guest stars were happy for the exposure they got on the Dean Martin Show, many of them did resent that they got no rehearsal with Dean! Dean would often make mistakes in his lines. Some guest stars just laughed it off when Dean would make some witty remark to the audience about how he was probably too drunk to remember his lines or some other excuse. Some guest stars, however, didn't care much for the unprofessionalism. The audience loved it though! The more mistakes Dean made, the louder they applauded and laughed! Another thing that disappointed some guest stars was that Dean would usually leave the set after he finished his last scene on Sunday, often without even thanking his guests for appearing on his show. Most realized that was just Dean's way. He probably had a party to attend, another performance somewhere, or would just prefer to go home after a busy week. Dean Martin began his TV host career along with partner Jerry Lewis on the "Colgate Comedy Hour" from 1950 through 1955. Dean and Jerry hosted the show 34 times out of its 184 episodes and guest-starred on many other episodes. Of course, even before 1950, Dean and Jerry had achieved fame as a comedy act in upper-crust nightclubs and Dean already had a substantial singing career. Dean had also appeared in his first movie, "My Friend Irma" in 1949 which was followed by "My Friend Irma Goes West" in 1950. Many men fantasized about being like Dean. His apparently carefree, non-stop partying lifestyle with a never-ending string of beautiful women at his fingertips made him almost heroic in many men's eyes. It may be hard to understand today but many women fantasized about being his lady, despite his anti-feminist lifestyle. Dean was just so good to look at and the never-ending carefree partying also appealed to them. Dean's songs were also the type that really appeal to women. Just consider the first few lines of his theme song, "Everybody loves somebody sometime ... Everybody falls in love somehow ... Something in your kiss just told me that sometime is now". And while he sang, he looked directly into the camera as if he was singing the love songs to each female viewer individually! For a young single girl or a woman whose husband hadn't told her, "I love you" in a year, that was pretty hard to resist. Make no mistake about it though. Many other women were disgusted by his acting as if women were simply put on Earth for his pleasure! When it premiered in 1965, the Dean Martin Show joined a pretty good lineup on NBC's Thursday night schedule. "Daniel Boone" was on from 7:30 to 8:30PM, "Laredo" from 8:30 to 9:30, "Mona McCluskey" from 9:30 to 10:00, and "The Dean Martin Show" ended prime time from 10:00 to 11:00PM. One unique idea that really worked for the Dean Martin Show was that each week a famous person (usually a TV or movie star) would walk through a door on the set to join Dean during the opening of the episode. Dean had no idea who it would be and seemed to be sincerely surprised when he saw them! 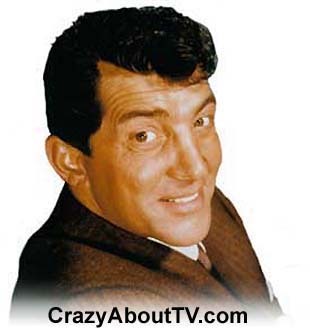 Dean Martin and the show's producer/director, Greg Garrison, owned all rights to the Dean Martin Show until the 1980s when they sold some of the rights to it. Those rights sold at a record price for a musical/variety show that had ended years earlier. They got a whopping $20 million dollars! Greg Garrison earned every dime of that money! The Dean Martin Show's ratings were actually falling steadily for the first few months it was on the air. Then Greg replaced the original producer, made changes to the show, and the ratings took off! One of the best features of the Dean Martin show was when Dean and his friends would get together and one of them would be the a victim of the others' jokes and insults. After this weekly show ended, many more of those episodes were "spun off" as the "Dean Martin Celebrity Roasts". Thank you for visiting our The Dean Martin Show page!